FEBRUARY IS DENTAL AWARENESS MONTH FOR PETS! Routine dentals start at $210. We are offereing FREE technician dental exams in JANUARY if you are wondering if your pet needs their teeth cleaned. If dental radiographs are needed, they will be provided 50% OFF. This promotion is first come, first served and ends February 28th, 2019. Prefer to shop online? Visit our online store for medications, food, treats and more! More than 85% of cats and dogs over 4 years old are affected by periodontal disease. Oral disease can lead to serious consequences for your pets, including infection, severe pain and even organ damage. The bacteria from periodontal disease can spread to their organs and cause serious illness! Maintaining healthy teeth and gums helps protect their organs, like the heart and kidneys from the damaging effects of dental disease. If a musky scent is coming from Fluffy's mouth, don't ignore it. 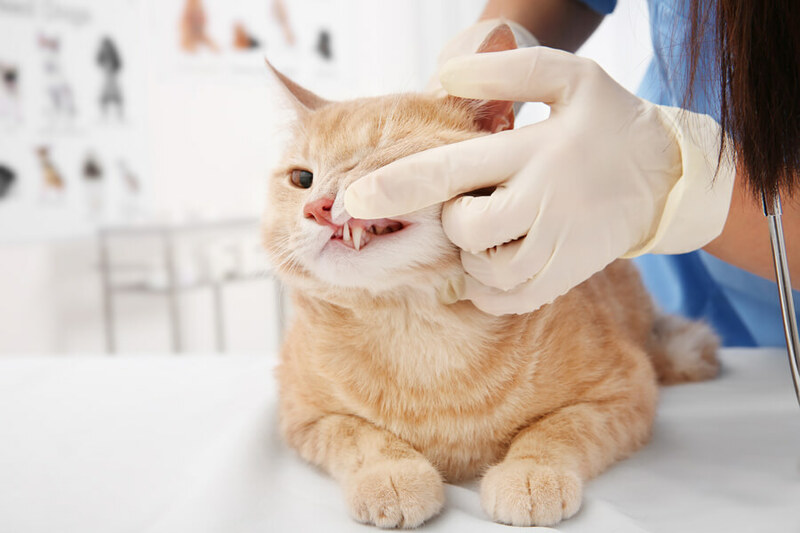 This could be a warning sign that she has periodontal disease or another oral disease such as stomatitis, a common feline condition that causes painful inflammation of the gums and mouth tissue. While it might be difficult at first, with enough patience and plenty of yummy rewards, you can turn tooth brushing into a bonding experience with your dog or cat. It might take several weeks to train your four-legged friend to warm up to the toothbrush, so start by letting him/her smell the toothbrush and toothpaste, then gradually work your way to brushing for 30 seconds on each side of his/her mouth at least every other day. Human toothpaste IS NOT SAFE for pets, so be sure to use a product approved by your vet. Check for the Seal of Acceptance from the Vetrerinary Oral Health Council to make sure that whatever alternative you chose meets the standards for effective plaque and tartar control. Consider dental toys, treats and food. While it's not as effective as brushing your pet's teeth, giving him/her treats, toys and food specifically designed to promote oral health will help them maintain healthy gums and teeth. Ask your vet for a dental exam. Humans aren't the only ones who need their chompers checked by a professional. We check out your pet's teeth and gums for redness, bleeding and inflammation. We also check for tooth loss, cracked teeth, plaque and tartar, as well as potentially cancerous lumps and bumps. Don't let anesthesia stop you from getting a dental cleaning. To thoroughly examine your pet's teeth and gums, properly get rid of nasty plaque and tartar, and really clean your pet's pearly whites, he or she will need to be anesthetized. The procedure has never been safer or more comfortable. Before your vet even begins anesthesia, we recommend prescreening tests to help ensure that your pet is healthy enough for the procedure (Blood work). Baby teeth are called "deciduous," which means "falling out or off at maturity." Removing retained deciduous teeth is very important. If not removed before all adult teeth are in, it may lead to decay and gum disease and affect the alignment of the adult teeth. Dogs have 28 deciduous teeth and 42 permanent teeth which are usually in place by 7 months. Cats have 26 deciduous teeth and 30 permanent teeth which are also in place by 7 months. Be sure to have your veterinarian monitor your young pet’s dental progress into adulthood! If you have any questions that are not answered in this article, please do not hesitate to call our doctors and staff at (231) 529-6227.